Color(s): Variety of colors that include: white, black, orange, red, and cream; may be solid or patterned. The Maltipom, also called the Pomanees, is created by the crossing of two breeds: Maltese and Pomeranian. They are commonly referred to as "designer dogs" and have become one of the popular smaller crosses. 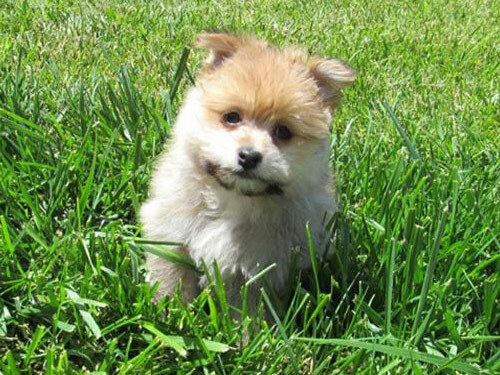 The ideal Maltipom should possess a keen and lively expression and be well-proportioned and sturdy in appearance. Affectionate, loyal, and devoted, the Maltipom is high-spirited and energetic. They do best in a home with older, considerate children. They do well with dogs and non-canine pets they have been raised with. Maltipom's do not do well if left alone for extended periods of time. Boredom and lonliness will lead to destructive behavior and incessant barking. They are wary and suspicious of strangers and are quick to announce visitors and out of the ordinary sounds. The Maltipom requires daily brushing to prevent matting and tangling. Bathing should be done when necessary using a mild shampoo. Dental hygiene is important to prevent early tooth loss. The Maltipom may be prone to such health issues as skin and respiratory problems, slipped stifle, eye infections, luxating patella, and heart problems. The Maltipom may have a single or double coat that is long and silky or long, straight, and profuse with a dense under coat. Early socialization and obedience are recommended. The Maltipom may be difficult to housebreak. The crate training method works best. They will not respond to harsh or heavy-handed methods. Training must be done with firmness, fairness, patience, and consistency. The Maltipom is well suited for apartment living. They are relatively active indoors provided they have a wide variety of safe toys to keep them occupied. They enjoy securely leashed walks, family play sessions, and off-lead play time in a securely fenced yard.